This mid-sized orchestra shaped acoustic is equally suited for strumming and fingerpicking, and produces a sweet, balanced tone. The perfect choice for the versatile musician, the OM-140 features a solid Sitka spruce top and solid African mahogany back and sides. Other premium features include a bone nut and saddle and mother-of-pearl rosette. This model also has a 1¾” nut width on a vintage shaped Guild neck, iconic Chesterfield headstock emblem reminiscent of 1960s Guilds, period-correct tortoiseshell pickguard, and Guild’s new lightweight polyfoam case. Available in Natural or Antique Sunburst gloss finish. This model is no longer in production and 2017 USA pricing is reflected. 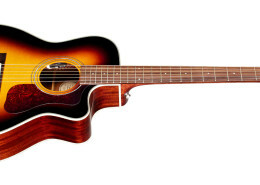 The closest current model is the OM-140CE Antique Sunburst. If you have any troubles finding a dealer near you, please don’t hesitate to contact us and a Guild Representative will be happy to help.